Carbon fibre construction features in the XTR Di2 derailleur. For those who have ventured to the East coast of the United States, where the Ultra Cross courses are tough and the gravel is gnarly, a machine with the option to run uber low gearing normally associated with a mountain bike, but on a rig with drop bars is the answer to that question. Also, there are the occasions when heavy rain falls, turning a gravel ride / race into a boggy quagmire, where wider tires (tyres) and mega clearance are the order of the day. These parts solve an issue that cropped up when JOM converted his Lynskey Monster Cross bike to 11 speed – all in the name of gaining an extra 36 tooth cog. Financially, that 36 tooth cog ended up costing some serious cash. Don’t ask. In reality, JOM’s Monster Cross bike is a 29’er mountain bike frame with rigid fork and drop handlebars – what we call Monster Cross around here. The bottom bracket shell is 73mm wide, versus a regular road bike bottom bracket shell which measures 68mm in width. The Lynskey was originally built with Shimano Ultegra Di2 10 speed front and rear road derailleurs, 10 speed chain, running in conjunction with a 10 speed Shimano XTR MTB crankset. When shifting the chain from the small to the big chainring, a front derailleur needs to move a certain distance up and to the right for that change to happen. 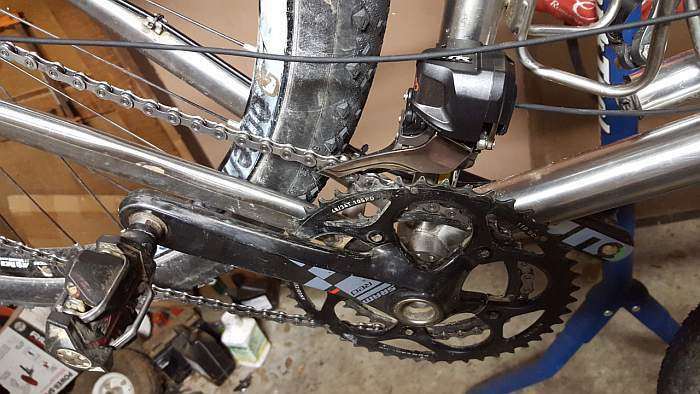 In the case of a road derailleur involving an MTB width bottom bracket shell, a road derailleur needs to move further to the right than planned by the manufacturer – remember, 68mm road bottom bracket shell versus 73mm MTB bottom bracket shell. When the Lynskey was originally assembled with its 10 speed road drivetrain, the chain shifted perfectly between chainrings, in both directions. However, an 11 speed chain is narrower, narrow enough to make a difference in front derailleur shifting performance. What does this mean? Simply put, the chain will not always catch cleanly onto the shifting ramps of the big chainring, and hence, front derailleur shifting becomes unreliable. In JOM’s situation, once the Shimano Ultegra Di2 11 speed rear derailleur and matching chain had been installed (with an Ultegra Di2 10 speed front derailleur still in place), the chain would only climb onto the big chainring if positioned on four of the eleven cogs on the rear cassette, closest to the spoke side. The rest of the time, the chain would clang around the place trying to shift to the big chainring, and sometimes fall off the small chainring altogether – not optimal. Then, Shimano XTR Di2 became available. This meant, Dr. Pain and I (JOM) spent some time playing with various combinations of cranks, bikes and cassettes, to figure out what works and what doesn’t with Shimano XTR Di2 – and, we’re using road Di2 shifters. Some of this information may be old to some and new to others, but we hope you find it helpful. Another helpful resource is Shiman’o eTube compatibility chart – this takes a lot of the guesswork out of which components work together, and which ones don’t. Before you can think about mixing Shimano’s XTR Di2 MTB derailleurs with the company’s mechanical brake or hydraulic brake road Di2 shifters, some firmware needs to be updated using Shimano’s eTube software. Namely the battery, SM-BTR1 for external or SM-BTR2 for internal; they need to be on Version 3.0.10 – at the time of this article. Technically, the external battery contains no chip, rather, the holder that seats the battery contains the chip that stores the firmware. The internal battery hides a chip somewhere inside its casing. The road shifters, hydro or otherwise, will not recognize the XTR Di2 derailleurs until this battery update has taken place. SM-BTR2 at top, with SM-BTR1 at bottom (battery ejected). eTube screen – Internal battery SM-BTR2 is on firmware version 3.0.10. Other components such as Junction Box A – part SM-EW90-A (3 port), SM-EW90-B (5 port), front and rear derailleurs, road shifters, climbing switches and even the SM-PCE1 or SM-BCR2 modules for system configuration / battery charging should have their firmware updated, if available. Road Di2 derailleurs and XTR Di2 derailleurs cannot be mixed and matched. For example, you cannot use a Di2 road front derailleur in conjunction an XTR Di2 rear derailleur – Shimano blocks this with the system firmware. Some people will claim it can be done, but we’ve yet to see a working example. If Battery update V3.0.10 has taken place, you can no longer mix and match 10 and 11 speed Di2 road derailleurs – note, the firmware which prevents this may be an earlier version – Shimano isn’t forthcoming with information on their website. Incidentally, they play well together until this, or a slightly earlier firmware upgrade has taken place. Junction Box A, part number SM-EW67-A-E – the original junction box for Ultegra 10 speed Di2 does not work with Shimano’s XTR Di2 derailleurs. If using a double chainring crankset, aka 2 x 11, when XTR Di2 is shifted to the small chainring, the system WILL NOT shift beyond the 8th cassette cog. In other words, you will not be able to use your 11, 12 or 13 while on the small chainring. Why? This is to prevent issues with cross chaining. However, similar gear ratios can be attained by shifting to the big chainring, and a bigger cassette cog on the rear derailleur. Original Ultegra Di2 junction box at right – NOT compatible with XTR Di2. The XTR Di2 system works flawlessly as a 1 x 11 system with regular or hydro Di2 road shifters – in either case, the front derailleur is not required. Because the XTR Di2 derailleur has a clutch, chain tension is kept consistent to avoid slapping against the chainstay, etc. Keep in mind the clutch does add some drivetrain drag in certain gears. Thankfully, the clutch is easy to disengage, although Shimano may frown up on this during normal pedaling operation. This scenario involved Dr. Pain’s Monster Cross bike, which is a full custom rig featuring a 68mm road bottom bracket shell and compact road crankset. In his case, 48 / 34 tooth chainrings are fitted to the crankset. The Good – Even though the XTR Di2’s front derailleur cage is about two centimetres shorter than its road equivalent, it shifts flawlessly between 48T and 34T chainrings. Dr. Pain’s fancy test rig, wires and stuff hanging everywhere. The Bad – When the chain was on the small chainring, the inner front derailleur cage would rub against the chain when the rear derailleur was shifted to one of the three cassette cogs closest to the spokes. This is due to the decreased bottom bracket width; the derailleur cannot move far enough to the left. The special XTR Di2 front derailleur mount (the low mount in our case) left a 5mm gap between the seat tube and the mount itself – I (JOM) don’t recall the seat tube size of Dr. Pain’s frame, but it required us to use the thicker of the two spacer sets supplied with the XTR Di2 front derailleur mount. If a custom, ovalized spacer set could be fabricated, the problem would be solved, allowing the derailleur to sit further left, relative to a road crankset. On the original Gravel Cyclist Facebook teaser post about XTR Di2, Brantley Smith reported he has the XTR Di2 front and rear derailleurs working perfectly on a Raleigh cyclocross bike. Normally, cyclocross frames utilize a 68mm road bottom bracket shell. So, it seems the XTR Di2 front derailleur may work with some road type frames, and possibly not others. Considering Shimano “allows” the road type Junction A boxes / road Di2 shifters to work with XTR Di2 derailleurs in their firmware, this indicates the system was designed to cater for road bike use, or more appropriately, cyclocross / gravel bike use. Do your research before purchase – mounting the front derailleur is key. At the time of writing, the largest chainrings offered by Shimano on their XTR 9000 11 speed series of cranksets is 38 teeth for a double, 40 teeth for a triple and 36 teeth for a single. JOM’s Lynskey rig utilizes an XTR FC-M985 10 speed crankset, with 42 / 28 chainrings. Shimano don’t recommend mixing 10 and 11 speed parts. Rules are meant to be broken! With a SRAM PG1170 11-36 11 speed cassette installed, the drivetrain shifts flawlessly on both derailleurs. You will need to place close attention to the rear derailleur B-screw – this needs to be set appropriately to allow for clearance between the top derailleur pulley and the largest cassette cogs. With a SRAM PG1170 11-26 11 speed road cassette install, the derailleur pulleys need to sit closer to the cassette, accomplished by turning the rear derailleur B-screw counter-clockwise. Otherwise, shifting will be hesitant on some cogs, especially during the downshift. On JOM’s bike, the drivetrain shifts flawlessly on both derailleurs. However, with a chain cut to length for a larger cassette, such as the 11-36 referenced above, you will see some chain slack on the small chainring with some of the smaller cassette cogs, such as the 14 tooth. Ideally, if switching wheels or cassettes semi-regularly, it is advisable to switch to a second chain to account for optimal chain length and shifting. 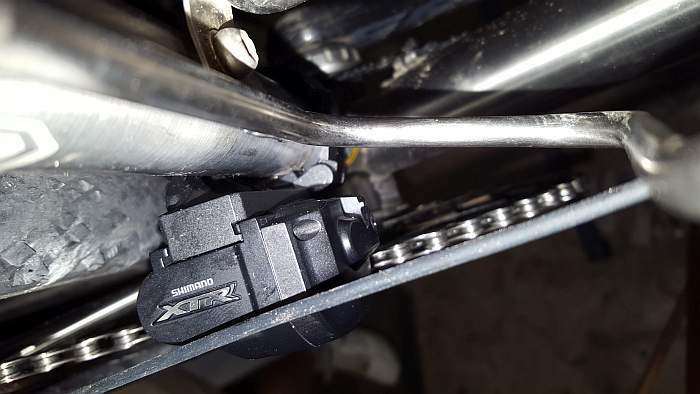 Finally, a brief video demonstration of the Shimano XTR Di2 2 x 11 system in action – on a SRAM PG1170 11-26 road cassette. Don’t mind the suspect Di2 wiring hanging all over the place, I’m not quite finished with everything. want to return to a one speed bike with kick brakes. being stopped by anything but flat tires and bullies. I’ve just set up a 2X XTR Di2 system on a “gravel” bike. With a 11-40 XT cog it shifts fine. But, with an 11-32 road cassette it doesn’t shift properly. I think (though, I can’t find any information to back this up) it’s because the spacing is different between Shimano road and MTB cassettes. Ideally, I want a road cassette for road wheels and a big 40t MTB cassette for 650B wheels and off road adventures. Are the SRAM cassettes you used the same spacing as Shimano MTB cassettes? Robert, adjust the B-screw on the XTR Di2 derailleur – they are VERY sensitive to cassette changes. You will need to bring the derailleur closer to the pulleys, so turn the B-screw counter-clockwise. That will vastly improve shifting to near perfection. I’ve used XTR Di2 with an 11-25 road cassette, no problems. The problem I have is that the road cassette sits too far inbound (left, from behind the bike). The MTB cassette all sits further to the right (which allows MTB 11 speed to fit on 10 speed hubs). I’ve tried a spacer, but it doesn’t quite (It’s so frustratingly close!) move it far enough add any more spacers and the lock ring doesn’t fit (and i’m using very narrow spacers). It shifts perfectly going down the cassette, but just isn’t quite there to go up to the bigger cogs on some gears. Thanks for exploring the question of compatibility between different combinations of Shimano Di2 components. Question: my interest is modifying the XTR-Di2 by substituting an Ultegra-Di2 11-28 rear cassette in a the XTR-Di2 front triple crank drivetrain. Would such an arrangement work (assuming the bike is designed to take an MTB front crank) ? This will then give my wife and I (both senior citizens who are not strong cyclists) the benefit of a reasonably ‘close-ratio’ drivetrain while retaining a ‘granny gear’ for hills/headwinds/tiredness. Unfortunately, we have not tinkered with the XTR Di2 front triple crank configuration. When talking about the standard 11-40 11 speed XTR cassette, Shimano list a separate part number for the triple version – ICSM9001140 – whereas the regular 1x and 2x 11-40 cassette is part number ICSM9000140. Shimano specifically mention their 1x and 2x cassette is optimized for those drive-trains and not compatible with Dyna-Sys11 triple cranksets. I have not seen the triple version of the cassette, so I have no idea how it is incompatible or how it differs. Per Shimano, the triple cassette fits onto regular 10 speed hub bodies, and the latest 11 speed hub bodies, just as with the 1x and 2x cassettes – strange. Your best shot is to find a dealer who has a triple setup in stock – along with the triple XTR Di2 front derailleur – this will be hard to find – and see what you find out. I have run an 11-28 Ultegra cassette and an 11-26 SRAM PG1170 cassette with my 2×11 XTR Di2 system, absolutely no worries whatsoever. If you like, I can run this question by the guys at the Shimano S-Tech website. Thanks a lot for sharing the outcomes of your tinkering! You may have even outlined a solution to my quandary (below), but I am not sure. Here is what I and my LBS cannot solve. I need crazily wide gear range on my road bike. At most 24 gear-inches low (many local long ramps are 20-30%, and I my knees are 61 yrs old), 125-130 high (can explain, nothing to do with downhills). Wanted to go electronic. Ultegra Di2 easily gives the high end, XTR Di2 gives the low end. As you mention, they don’t mix. As you say, “the largest chainrings offered by Shimano on their XTR 9000 11 speed series of cranksets is 38 teeth for a double, 40 teeth for a triple”. And I need a 52t big ring. So, no electronic XTR FD for me? 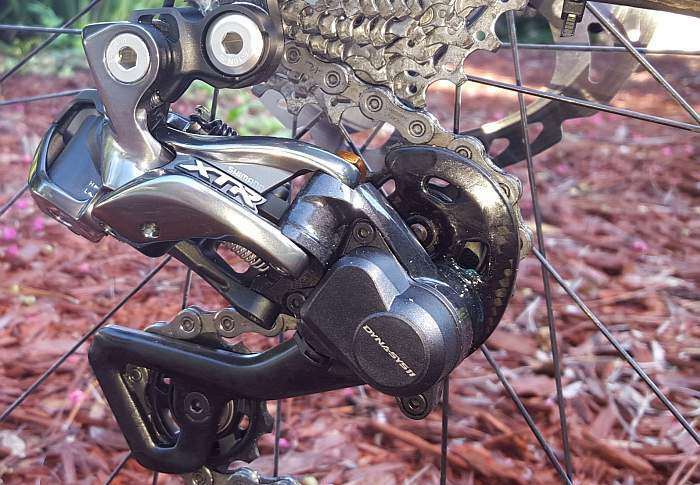 Or should I take to heart your “XTR Di2’s front derailleur … shifts flawlessly between 48T and 34T chainrings”, extrapolate to “between 52 and 38” and use Sram cranks? I can live with the low of 38×40. Or can I run 1×11 XTR Di2 and use a mechanical FD with a double of my choice? Thanks for the cool article. So is it correct to say that a 1×11 setup would work with an xtr di2 rear dérailleur but for shifters, use shimano satellite climber shifters? This seems super clean and awesome way to do things. Assuming all updates to software done, this is possible, right? Thanks in advance! Thanks for sharing. I am running mine in 1 x 11 right now, but after receiving the XTR triple cranks from my wife for Christmas, I’ll be increasing my top-end gearing. Afraid I don’t know the answer to that question. I could post the question about Firebolt shifters and Ultegra Di2 to the Shimano tech Forum. You should be able to. A friend is using the XTR shifters on a Alfine 11 Di2 with XTR junction box with no issues. Retrofitted a flat bar bike with Ultegra Di2 derailleurs and XTR shifters. Very successful. Did further modification replacing the right side lever shifter with an R600 climbing button. Much more handy. I enjoy what you guys are up too. This type of clever work and coverage! Keep up the amazing works guys I’ve incorporated you guys to blogroll. I don’t think your chainrings will cause an issue, but the 68mm bottom bracket shell might. In our article, we mentioned the front derailleur would not move far enough to the left when positioned on the small chainring. This was due to the large gap between the derailleur’s mount and the seat tube of the bike – our photo illustrated about a 5mm gap. A custom spacer could correct this issue. Unfortunately, that is the best advice we can offer at this time. Perhaps another reader may chime in with some further advice. JOM Thank you for your advice, I may look at the spacer and give it a try, unless I can find the chain rings I want for the Next SL crankset. Thanks for the good article. I am currently running 1×11 with XTR Di2 rearmech. Would love to go to 2×11 XTR Di2 on my CX with road BB shell. You wrote that you do not know the seat tube diameter, could you elaborate the diameter? Mine is 34.9 and if yours is the same I would have to look into the possibility of fabricating a custom spacer. Have you also tinkered with the sincroshift function? Or does this only work with Shimano’s own cranksets/gears? Hi, can you elaborate more on the 1×11 setup with different cassette options? Shimano only recommends using the 11-40t cassette however I’d really like to run an 11-28t cassette. Would this work well? We’ve only tinkered with the 1 x 11 setup on the workstand. However, I use a 11-26 cassette with XTR Di2 all of the time and it shifts perfectly with my 2 x 11 setup. The XTR Di2 derailleur is sensitive when it comes to B-screw adjustments so that needs to be set accordingly. You’ll need to bring the derailleur much closer to the cogs than you would with a big cassette such as an 11-40. But, if the B-screw is adjusted correctly (turn it counter-clockwise to bring closer to the cogs), you will experience crisp and fast shifting. Chain length is also key – what works for a 11-40 will not work with an 11-28. 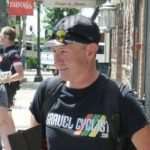 Hi, I’m looking to set up a gravel bike–it has a BB386EVO bottom bracket–with XTR Di2 using an 11-40T cassette in rear and a compact (50-34T) crankset in front–specifically, the power2max K-Force light for BB386EVO crank outfitted with 50-34 rings. As to whether I can do this, it sounds from this article that the answer is “it depends”. I don’t understand the bottom bracket jungle very well–the discussion about 68 mm shells was lost on me, but I understand BB386EVO accommodates much wider diameter shells. Will this make the XTR Di2 FD and compact crank I have incompatible? Many thanks for any advice! I don’t want to make a very expensive mistake. 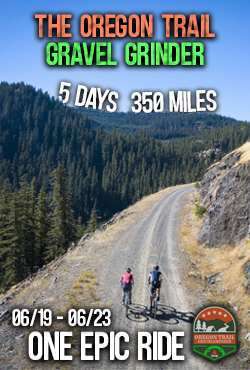 68mm width = Road, 73mm width = MTB. When used with a road width bottom bracket bike, the XTR Di2 derailleur may be unable to move far enough to the left to completely clear the chain when the chain is positioned on the small chainring. The XTR Di2 derailleur uses a special mount that fixes it in position a certain distance away from the seattube. So, it may work for some frames, but not others. In our test case, it didn’t work. We did manufacturer a custom spacer made from Sugru that did move the mount closer to the seattube, but it wasn’t ideal. We haven’t tested a 50 / 34 combination with an 11-40 and Ultegra Di2, but I expect it should work without any trouble. However, be extremely careful and avoid cross chaining… we do not recommend using the 50 tooth chainring with the 40 tooth rear cog on the road. Definitely check this over closely on the workstand – be sure you have enough chain. Finally, the Ultegra Di2 derailleur does not have a clutch. XTR Di2 does – the clutch is very handy in muddy situations. Thanks so much for this. The only reason I wish I could go with XTR Di2 or XT di2 for the 50/34 2x setup is that, while I am starting out with a 2x setup on my new 3T exploro, I may want in the future to convert to pure 1x, and as you mention, the clutch is often necessary for certain conditions. But I suppose I will start out with the 50/34 Ui2 combo with a mid cage RD with a Roadlink and an 11-40T cassette in the rear. This will give me that bailout gear but also the big gear I might need for pavement riding. Will be very cautious not to go big big–I only wish I could configure my Garmin to warn me of my gear choices (with d-fly inputs) the way the Magellan Cyclo 505 can when you are riding poor chain line. What a horrendous first world problem! The advantage of XTR is that out-of-the-box it won’t allow you to cross chain. And you can also set up the synchroshifting to specifically tell it when you want to shift the FD for you. Works very well for my back country loaded rig with 22/34/44 rings and10-42 cassette, which is well outside of the XTR chain wrap specs. Plus with XTR you get the clutch, and no need for a hanger extension. The only disadvantage I see to XTR FD and RD (with ultegra 6770 shifters), is that the FD spacing MAY not work for on a 68mm bottom bracket. For my 68mm BB frame, with very large 35mm frame tubes and tight 151mm Q factor road crank (Lightning), the FD spacing for a 3×11 works with no room to spare. The triple FD would seem to be the harder to configure since the small chain ring is so close to the frame, but I’ve not tried a 2x FD. I did adjust the FD electronic setting all the way to the inside limit, and there is a small physical adjustment on the FD as well. One option is to get mtn cranks which “flare” the cranks and I’d think place the rings a little further out. You have to be comfortable with a crank set that has a higher Q-factor and it might take some study to confirm ring spacing from frame. Maybe someone here can identify the 2x FD actual spacing from the mount in mm so other can build on that info. I have a friend building just such a bike, I can ask. Otherwise, the Ultegra approach seems to be proven in this forum to provide proper FD spacing. Oops Andy… I forgot about the eight cog XTR Di2 lockout you refer to on the small chainring – aka cross chain – at least on my 2 x 11 system. But, you can cross chain on the big chainring to the biggest cog, which is the worrying combination, especially with a 50T chainring and a 40T cog. Both the high and low ends are boxed out by the factory settings. It won’t allow the RD to shift into the largest three cogs when in the largest chainring. Nor the smallest three cogs from the small chainring. Nor the largest cog from the middle chainring in my 3×11 case. There is a picture of the map here: https://www.bikeforums.net/18826025-post59.html which indicates in grey the factory boxed out settings, and in green and blue the overlay of synchro shifting. The triple crank configuration XTR Di2 has all different part numbers for the front and rear derailleurs, and there is even a specific cassette (11-40, part# ICSM9001140), at least on the Shimano S-Tec website. I’ve not seen the 3 x 11 rear derailleur or specific cassette in person, so I’m curious what is different about those items… as you allude to, the drivetrain lockout on the big ring is quite different. I’d not noticed the RD triple had a different part number than the RD double. And not sure which I ordered and installed. Physically the two would be the same except maybe more play in the bottom pulley wheel?? Guessing. Or programming. Not sure how I can check for you. The FD is clearly physically different with a wider paddle and if any programming firmware resides in the unit that would be different. Im using a SRAM cassette 10-42 so the xtr model number never mattered. I might venture to guess that the triple and double groups are just bundled with part numbers to shops can order the set worry free. But the cassette and RD may well be identical. Confirmed, my builder has a 2×11 XTR FD and RD with Ultegra 6770 levers in the works this week. I’ll provide some dimensional data next week. Nice! Clearly this works on a frame by frame basis. So just to confirm, I could run a 1×11 setup with Ultegra 6870 di2 road shifters, the 9050 Di2 RD and then use TRP Hy/RD disc brakes? And this will handle the 11-40 cassette? Yes, the XTR Di2 M9050 derailleur works perfectly with a 40T cassette. TRP Hy/RD brakes will be no problem with the 6870 road shifters – you will need to use the 3 or 5 port Junction A box – the original Junction A box does not work with the XTR Di2 derailleurs. Be sure to run the system through the e-tube software, but put it in MTB mode when you do your firmware checks. The firmware will all need to be up to date. Excellent article – I’m upgrading a Trek Domane SLR 6 Disc to Di 2, using the Ultegra di2/Hydraulic shifters. So far, so good, but I’m planning to use the new bluetooth battery and wireless thingies, so questions are (which have my local dealer completely stumped) 1. With the either of the bar-mounted control centres (SC-MT800/SC-M9051), could I get Synchronised shift with the Ultegra derailleurs or would I need to go XT Di2? 2. If I have to go to XT Di2 derailleurs for synchronised shift, it seems from your article that I can use the ST-R785 shifters with them – will this still give me synchronised shift? 3. If I’m using a bar-mounted control centre, I clearly need to wire the shifters to it. Do I then still need a cable run to the bluetooth/ANT+ equipped battery/junction box or will all shift signals go wirelessly? 1. I believe you need the XT Di2 derailleurs for that system to work. However, Shimano gave hints they are going to offer synchro shifting for the new Dura-Ace, but I suspect they’ll do a firmware block to only allow those variants of their road system to work. Who knows? 2. Yes, you can use those shifters but I cannot confirm if synchro mode will work – I don’t own the SC-M9051, etc. However, I can post this question to the lads at Shimano S-Tec. 3. All of Shimano’s components are still wired. The ANT+ / bluetooth stuff is only related to external devices – meaning, you can use your phone to update and play with firmware on the system. 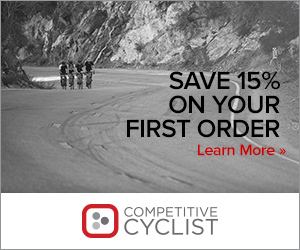 SRAM and FSA are the only companies offering wireless shifting of any kind at this time. I managed to get the XTR Di2 triple FD working with a set of narrow triple Q-factor cranks. Chainline is in the order of a normal road triple. The secret sauce here is to use a combination of 2 Direct Mount adapters… Shimano’s and one from Problem Solvers. I shaved down the Problem Solvers adapter by some 3mm and did a little modification to the Shimano DM adapter to reduce the backside slot depth. This hack would not typically be necessary for wider cranks & chainline, but we had a limited width to work with here. End result is that the shifting works great, even though I’m stretching the chainring spec by using 48/36/26 rings. Any chance you could upload those pics elsewhere? Not all of our readers have a BikeForums.net account… like me for example haha. Here’s my question, which I’m pretty sure hasn’t been covered. Grateful for anyone’s help. Say I have Dura Ace Di2 (RS785, the original hydro di2), and I have either the XTR or XT Di2 rear derailleur, and it’s a 1x setup for CX, so no FD to worry about. Does e-tube (or any other method) allow me to program the big paddle on the left and right shifters to perform opposite actions on the RD? I’m imagining something like SRAM eTap: hit the left big paddle for an easier gear, the right big paddle for a harder one. Otherwise, all the action is on the two buttons on the right shifter, and I could see a lot of mis-shifts in a CX race. Tony, I haven’t tested this configuration out, but I am certain it can be done using Shimano’s eTube Project software… I remember a fellow on another site (sorry, forgot where) who has your configuration. Firstly, be sure to put the eTube software into MTB mode. Then, you should be able to program the individual buttons on the shifter to provide what you’re looking for. If I get some spare time I could try it on my Monster CX bike (after unplugging the front derailleur) and see how it goes. But, if you get to it before me, please let us know your findings. Thanks! Thanks for that latest chart. Here’s what I need to understand: I’ve just completed a gravel-specific build of my Di2 Synapse. 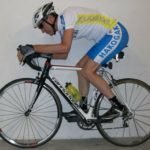 What I want to be able to do is configure the changes from the E-Tube Project software on my iPad, then hook the whole lot up either to an ANT+/Bluetooth cycle computer or my iPhone/Strava (obviously Bluetooth only). But what I don’t understand is why I’d need a BTDN-110 AND either a D-Fly or Wireless display as well: in the first case, surely I can just go direct to the BT battery from my iPad and, in the second, the computer or phone would take care of everything else. Richard, posing this question back to you… does the BT-DN110 master unit contain a wireless transmitter? My understanding is – no. I was wondering if anyone knows if it is possible to run a xtr di2 rear mech but shifted by two sprint shifters. this would be more a mountain bike. Sprint shifters have only a single button and shift direction, so no, you would not use these by themselves for shifting both a FD and RD. If you have both FD and RD, then the “climbing” shifters (2 buttons each) would be a usable option. Kaveh is describing a 1x setup and could use the two sprint shifters to shift up/down a RD – that would work fine. Crap, I made a typo. I meant to say climbing shifters work perfectly in this configuration. You are spot on about the sprinter shifters, sorry for the erroneous info – and for setting me straight. I’m finally in the process of upgrading the Ultegra Di2 groupset on my gravel bike to give me bluetooth configurability and Synchronised Shift: If I’ve read the Shimano documentation, I should be able to do that (in this case) by replacing the Junction A with the SC-MT800 and swapping batteries for the BT-DN110. Will know in the next couple of days. And it does indeed appear that the Bluetooth battery doesn’t actually have a BT radio in it, just the upgraded memory and firmware needed: the actual radio is in the SC-MT800 or the EW-WU101 units. Nice! Good luck with the installation, keep us posted how it goes. I have played with synchro shift on an MTB, but not a gravel or road bike. That went well: once I’d worked out that you can’t activate the Bluetooth LE setup if the charger is plugged in, I managed to get the SC-MT800 set up with the BT-DN110 battery in mere minutes: after upgrading the firmware on all components, I now seem to have synchronised shifting working perfectly with Ultegra shifters & mechs. I say “seem to” as I’m just waiting for a slightly longer E-Tube cable and a new circlip plier to turn up, to secure the battery into the seatpost. So I’ve got the opportunity of full synchronised shifting, partial or full manual by cycling through the button on the display, without having to reprogram the whole thing from my phone. Nice. I can confirm what Richard found. In order to get Syncro-shift to work with XT(R) derailleurs and Ultegra Shifters (and climbing buttons in my case) you have to use the SC-MT800 display/junction. Also you can’t mix EW-90 Junction A/B and the SC-MT800. If you need more than the 3 ports of the SC-MT800, you have to get the dumb SM-JC40 or 41 junction boxes. 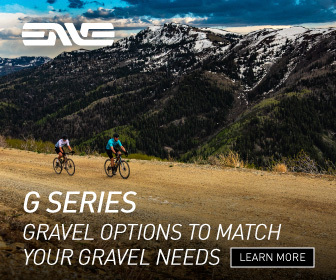 As for custom synchro-shifting, the E-Tube software doesn’t list the gearing you’d find on a gravel bike, so you have to ignore the ratios it lists, and substitute your gearing values in. I’m still testing and experimenting, but so far so good. Right now I’m testing 48/32 with an 11-34t. I have a set of 46/30 rings and an 11-40t cassette on the shelf. I tried the SRAM 11-36t, but just wasn’t happy with how it shifted and gear spacing… I think it would be perfect for a 1x setup though. John, since you reference XT(R), it would be best to indicate both XT and XTR displays will function to enable synchro with any type of Di2 shifter, not just the XT M8000. So the current situation is that while using DA or Ultegra DI2 shifters a Dura Ace/Ultegra DI2 FD with a XT/XTR RD will not work due to firmware? Assume bike fit for the FD has anyone tried using DA 9170 Shifters, 50/34 crankset, and XTR FD and RD with success? I would go with the 11-40t cassette. I don’t care about syncro shift, just a bigger range. I know the current fad is 1x, but lack of cadence options really wears on me on long gravel rides. On some bikes, the setup you describe may work, but it will depend on a frame-by-frame case. Generally, the XTR / XT Di2 front derailleur cannot move far enough left without rubbing the chain on the small ring, no matter how it is adjusted. With you on cadence options, 2x forever here. BTW, I have a very interesting video coming out involving the new DuraAce 9150 rear derailleur… watch the site / Facebook page for G.C. We both ended up with a -3mm FD offset, just enough to have the triple XTR FD operate a standard 68mm triple road chainring setup without chain rub. Works great. Regarding tinkering to accommodate lower gearing than 11×32 for the Di2, there is an interesting letter to the editor in the Dec 2017/Jan 2018 magazine, Adventure Cyclist. Catherine Stewart-Roache used the following setup: a 6870-GS 2×11 Di2 front derailleur and a Wolf Tooth RoadLink derailleur-hanger extension with a Shimano Ultegra 6870-GS, 11-speed medium-cage rear derailleur. This is a follow-up to my question that I sent yesterday as to what to relay to my LBS mechanic so that I could go 50-34 and 11-40. 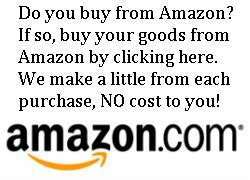 Your reply is much appreciated even though it concentrates on XTR or XT components. What do you think of Ms Stewart-Roache’s solution? Would it work with any road bike regardless of 68 or 73 mm bottom bracket? Apologies to all concerned, but the letter should be attributed to Phil Foreman and not Ms. Stewart-Roache. Sorry Len, haven’t seen the article. a 6870-GS 2×11 Di2 front derailleur and a Wolf Tooth RoadLink derailleur-hanger extension with a Shimano Ultegra 6870-GS, 11-speed medium-cage rear derailleur; a 50-34 chainring and an 11-40 cassette with the Di2. The letter does not contain any additional technical details. Regardless of not reading the LETTER, what is your opinion of the workability of Paul’s setup. FWIW v1.0 of my build used 6870 Ultegra with a Wolftooth Road link. I started with a 48-32 with a 11-34. I then tried the SRAM 11-36t. I cut about 4 links off the chain orginally and it was STRETCHED going around both big rings. I know you would never run that combo, but I made me think about how much chain I’d need if I tried going bigger on the ring/cog combo. One concern I’d have running that setup (and one reason I went XT/XTR) was the discipline it will take to avoid cross-chaining and chain drop issues with such a long chain and no clutch. Will xt di2 work with ultegra sti di2. Just tried the xt di2 rear with my ultegra di2 shifters. have 2X 44 and 36 up front and 40 -11 rear cassette. No movement from rear derailleur. Hi there… XT Di2 does work with the road shifters, but, if you are trying to use an XT Di rear derailleur with the Ultegra Di2 or Dura-Ace Di2 front derailleur, it will not work. 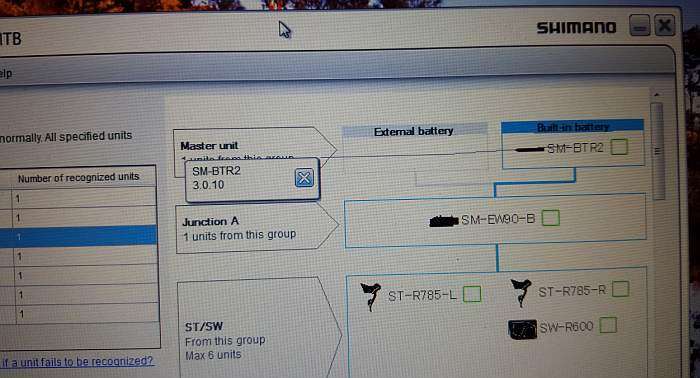 Shimano insists that their component groups cannot be mixed, courtesy of firmware. As a side note, if you have an XT Di2 front and rear derailleur set there, you will need to place your Etube software into MTB mode to configure. Good luck! Very interesting discussion! Here is my situation: I have 6800 Di2 Ultegra GS mechs. I want to have two sets of wheels that I can easily swap out, one 700c road wheels, and one 650b MTB wheels. The road wheels have an 11-32 cassette. The 650b would be either an XT 11-34 or XT 11-40. My question is can I run the XT 11-40 without the Road Link? I’m concerned that using a Road Link will not work with my 700c road wheels with the 11-32 cassette very well. Thread is really about mixing road Di2 with XTR, not if a Roadlink is optimal on a Ultegra RD. Yes it will work with the 11-32, no it is not optimal as the top jockey wheel is moved away from the cogs which will slow engagement a touch when shifting. Degradation in shifting is more apparent as drive components (especially chain) wear. Regardless, if using all road Di2 components, the Roadlink is the cheapest ($20) answer to extending the RD for a 11-40 cassette. Alternative is to get the expensive ($350?) K-Edge cage installed on your RD and that will shift better than with the Roadlink. The K-Edge moves the top jockey wheel rearward but maintains a closer proximity to the cogs which means better shifting. Jayson, I really wasn’t interested in using a Roadlink. What I was really asking is if I can use an XT or XTR 11-40 cassette with my 6870 gs (long) derailleur without a Roadlink. This isn’t Jason, or a Di2 issue, and no, the posted max cog capacity for the 11spd Ultegra GS cage RD is only 32t. There is a good reason they provide the max cog spec and it is not internet conjecture. The only way you will get the Ultegra RD to 40t is via extending the RD with a Roadlink or K-Edge type solution. I just wondered if the 6870 would do it as well. As you know Shimano is notorious for conservative ratings in part because they have to warranty the product. After all, this thread was titled “Tinkering” which I interpret as going outside of the “recommended” specification, which this obviously is. Mech was new, I didn’t touch the b-screw. Shifting has been great except when the jockey wheels and mech got filled with thick stiff mud. The r8000 RD is not the same as the RD-8000 series (you inquire about 8070). The r8000 has a drastically different cage. correction, you inquire about RD-6870 (6800 series). Hi – thanks for an awesome post! Will this mean that i can use Ultegra Di2 6770 together with RD-M8050-GS. I´m building a c 1×10 cyclo cross and i really want the electronic gear. You can use the shift levers, but NOT the 6770 front derailleur and RD-M8050-GS. 1. Shimano prevented 10/11 speed Di2 derailleurs from playing together some time ago. 2. Di2 Road and MTB derailleurs do not mix due to a firmware block. So, you either run an XTR/XT Di2 front and rear derailleur together with your Di2 6770 road levers, or ditch the front derailleur and do a 1x with a XTR/XT Di2 rear derailleur. So if i understand that correct (i will not use any front derailleur only 1x for my) 6770 shift levers goes hand in hand with any xtr/xt rear derailleur. Will it be any problem when the rear derailleur is 1×11 and the shift levers are 1×10? Vidar, correct. The shift levers are just switches. They can shift 10 and 11-speed derailleurs no worries at all. You may need to update your firmware for everything to play nicely, and you will need Shimano’s eTube software to be in MTB mode when you set it up.